Top quality with a really modern light oak finish, our 1800mm modular folding table is chic looking and incredibly easy to set up. 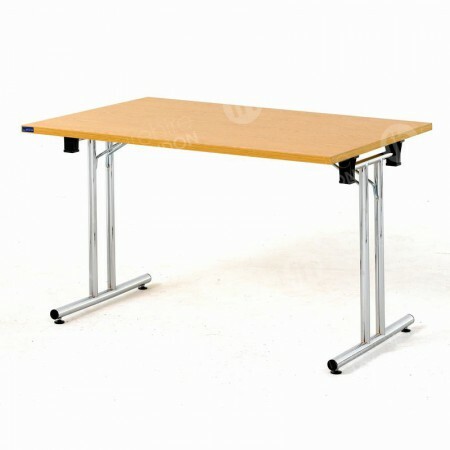 The legs unfold in seconds so you get premium tables in a flash! Where can’t our modular tables go? From the very start tables have always been versatile. Experts can’t exactly pinpoint when they were first invented as we know them today, but one thing’s for sure, they’ve always been very useful for so many different reasons! Today we regularly hire out lots of our 1800mm modular folding tables to a huge variety of London functions. Whether they’re being used for corporate meetings, conferences, study areas, exhibitions, at book signings in offices or at receptions - this product line is sturdy, easy to put up and very stylish looking too. There’s evidence that tables have been a true global hit for thousands of years. Populations across the world used them in slightly different ways, and they were also made differently too, depending on the materials available and the preferences in each culture. Experts suggest that some of the earliest tables hailed from Ancient Egypt, where stones were used as platforms so delicate objects or food was kept off flooring. Elsewhere, the Greeks and Romans produced very opulent types of tables using marble and a variety of metals. Utilising different materials to CREATE TABLE IF NOT EXISTSs makes sense, as each culture used what was available, but historians believe they were also used in a different way too. The Chinese adapted theirs so they could complete drawings and artworks on them, while in Ancient Egypt, it’s thought that tables were not surrounded by people all looking forward to eating the food presented but were used as standalone furniture. Over the years, as techniques to CREATE TABLE IF NOT EXISTSs became more innovative, many different types were made. Some of the first trestle tables were manufactured in the Middle Ages, and others followed, such as work, end and chess tables. Like with creators over the years, we’ve looked at what our customers need and made sure our 1800mm modular folding table meets all your requirements! As with lots of other products in our range - such as our 1200mm & D-End tables, as well as our desks - we’ve had these especially made for you. With lots of consideration, our tables have been designed to very high specifications. First off, we’ve made sure that top quality melamine is used for the surface of our modular tables. This is exceptionally robust, so whether it’s being used for working on, taking notes or eating on, it’ll wipe clean very easily. As well as being heat and stain resistant, the finish of this table is very contemporary and stylish - so you can install them as any smart occasion with pride, which many of our customers have done, from book signings that have made the national papers to very large professional exhibitions. Other top features of our modular tables include the folding leg mechanism, which allows you to set up each 1800mm table in mere seconds - it’s really that quick. 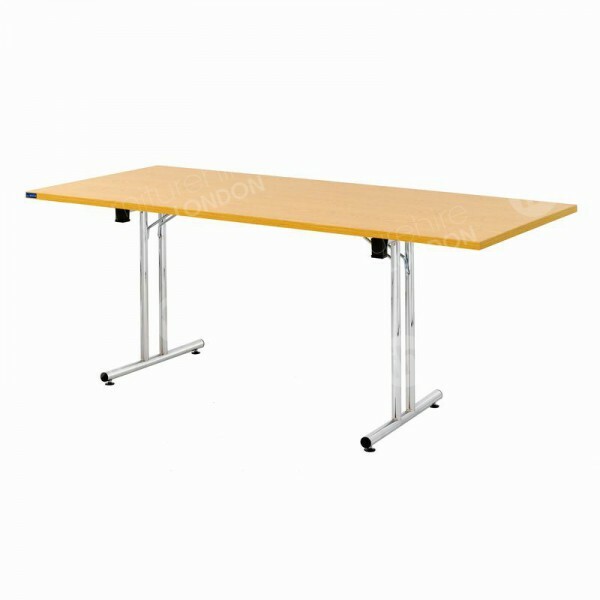 This means the tables fold down for easy storage and transport, and also results in rapid set ups. Our modular tables are a combination of all those very handy features that have appeared in these products over the years, with some new ones added, to make your life a little easier! 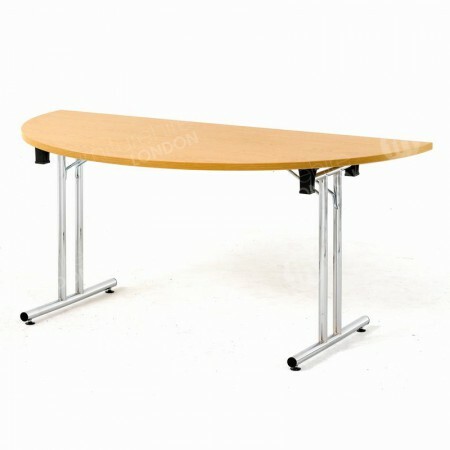 Do you offer this table in a different size? Yes, if you’d like a smaller table, we have our 1200mm available. We need a large table for at least 14 people - do you have anything like that? Definitely! Basically you can configure our tables in any way that suits you. For 14 people you could try placing our rectangular tables in a horseshoe shape, or combine a collection of our rectangular tables and D-ends to create an oblong-shaped product that seats this number of people or fewer.